Lisa Bacic from Phonak recently volunteered at our project in Malawi. As a speech-language pathologist she knows that adapting communication resources is very important for a successful therapy. Because not every child in the world knows who wears a red suit and says “Ho, Ho, Ho”. 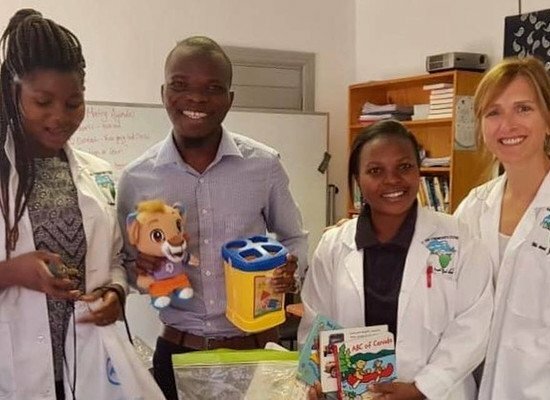 The clinicians at the ABC Hearing and Training Center, Hear the World Foundation’s project partner in Malawi, recently made a request for a speech therapist volunteer. Many kids they see for hearing tests have speech and language difficulties, and in a low income country like Malawi, children left untreated have little chance of receiving a school education. Given this reality, their clinicians wanted to add resources to their toolbox so families can leave appointments with some guidance on how to promote speech and language development in their children. For this, we discussed what activities were typical for a Malawian family, and which activities would not be common. For example, in North America, we might tell families to read their child a book at bedtime and talk about the story together. Well, ‘bedtime’ is not a common concept in Malawi. Most children do not put on their pajamas, have a night time snack and have a book read to them before bed. My colleagues smiled when I described this routine and told me that kids in Malawi go to sleep when it’s time for bed, there is no ‘routine’. But, I learned that there are many other language-rich opportunities for Malawian children. For example, music is a big part of their lives and singing songs can be enjoyed when meals are being prepared. As they described many of the traditional songs (a Malawian version of “Head and Shoulders, Knees and Toes”), I smiled. These widely-known Malawian songs would be perfect examples to give families.